Six or so weeks ago I mentioned in a Trip Planning post that my wife and I were heading to the Oregon Coast for a week to spend time with family and hopefully find some nearby trails. I wasn't sure how much spare time we'd have to hike, but we went with a great deal of optimism and some of our gear basics. Well, we ended up not having the time nor energy to do any overnight trips, so instead we did a number of nice day trips, including a 5-mile "Introduction to Hiking" hike with our 13-year-old nephew. He's a suburban kid with nothing but video games and reality TV shows on his mind, so it was nice that he was willing to (after a little coercion from his mother) hike with us and after the initial complaining (ie: "Eww, my shoes are getting muddy"), he actually enjoyed the experience. I didn't think I'd do a trip report mostly because it was a number of shorter hikes instead of one lengthy one, but then I though, why not? Someone might find it useful and it's better to share than to keep it to myself. 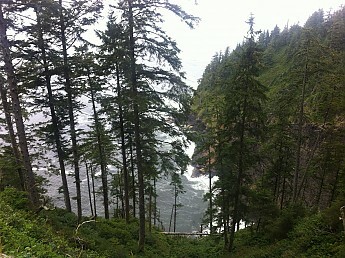 So, here's a little breakdown of the day-hikes we did on the Oregon Coast. 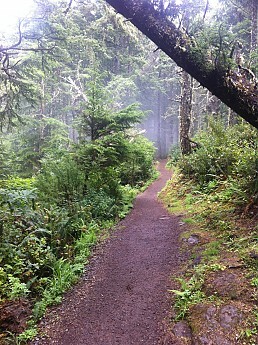 We were staying in Oceanside, which is a small coastal village not far from Tillamook and most of these hikes are in that general area. Note: If you read my trip planning discussion on this topic, you'll notice I already posted a lot of this info on that thread too. I thought it would be best to have a trip report as well, especially for anyone who may be looking for info on this area in the future. 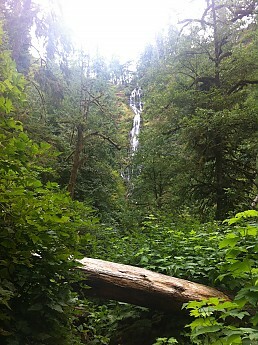 First was Munson Creek Falls. I've read two accounts of it being 266' and 319' tall. That's a big difference and I assume some of those figures are the height of the rock formation while other measurements may be the height of the actual fall of water. I believe it is one of the top ten tallest waterfalls in Oregon, but it doesn't see nearly the foot traffic that the waterfalls in the Columbia River Gorge get. The upper trail, which provides much more scenic views, was closed, so we opted to take the much shorter, much less scenic lower trail. This was a bit of a disappointment because the upper trail was inaccessible. Early spring or late winter would be a much better time to enjoy these falls. Cape Meares Scenic Viewpoint and Wildlife Refuge was next on the list with ten members of our extended family coming along, ranging in age from 92 to 2. We checked out the lighthouse which sits on the tip of the cape, 200+ feet over the ocean. We also checked out the nearby popular Octopus tree (sorry, not very interesting) and also the less promoted but way more interesting, largest Sitka spruce in Oregon which is nearby. It was a typical day on the coast with lots of fog and moisture in the air, so visibility was pretty crummy. 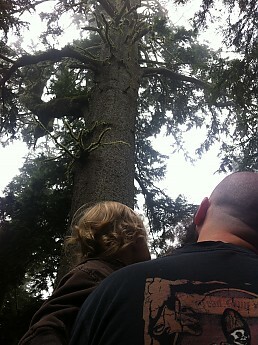 My nephew and brother-in-law taking in the largest Sitka spruce in Oregon. I couldn't resist, he's just too darn adorable. This was the little one's first trail experience and he couldn't get enough of it. He was checking out everything and running around so joyfully. 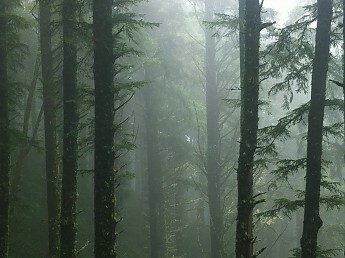 The beauty of the Pacific Northwest forests. The beauty of my wife resting and contemplating mid-hike. 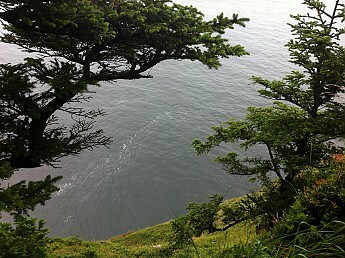 Hiking above the mighty ocean. Hiking while listening to waves crash below you is a wonderful experience. 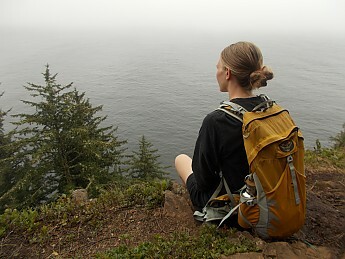 In some of the exposed areas, it's best to pay more attention to the trail than the water below. One slip and it's a long way down and a very wet landing. …then it does it a lot of this. 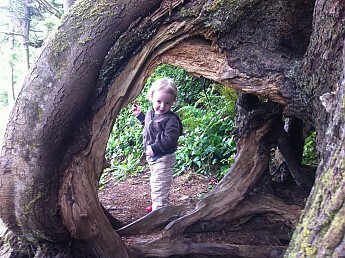 We promised our nephew that if he hiked with us we would take him out for a treat afterwards. Obviously there was a bit of self-interest going on here as I knew very well that Pelican Brewery was only a short distance away. While our nephew enjoyed his cheesecake, my wife and I happily sipped some brews with our toes in the sand. Lacamas Park Trails - Round Lake and Lacamas Creek - The Potholes Falls - 4.5 miles - This nice little hike was thrown together last minute but ended up being a very enjoyable hike. It's not on the coast, but rather near the city of Camas, which is just outside Vancouver, WA. A mix of riverside hiking, lakeside hiking and mixed-use trails (some beautiful mountain bike trails that I would have loved to ride if I had my bike with me), as well as a fantastic swimming hole that local teenagers frequent. 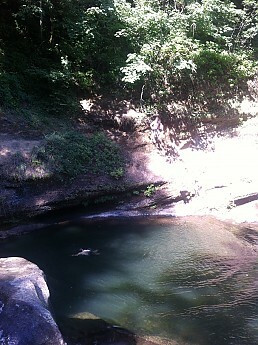 The Potholes Falls, which is a great swimming hole and all the local teens know it. Can you spot the guy that is falling through the air in this photo? 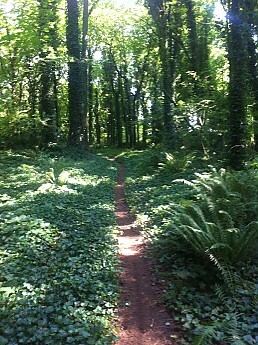 We stumbled upon a nice single-track for mountain bike riders. Too bad I was on my feet and not my pedals. 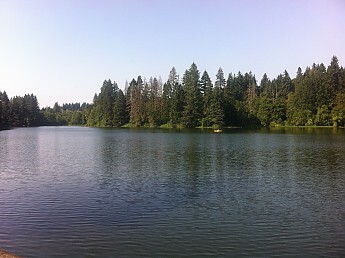 A peaceful late afternoon at Round Lake. Wait a minute....that brewery is right on the beach!? Not sure I could be anymore jealous! Beautiful shots! Sounds like a fun trip and its awesome that you got to introduce someone to the great outdoors! Thanks for sharing your trip with us, Kiwi! One of my best friends just moved out to the Oregon Coast. My husband and I are going to try to make a trip out there soon. I can't wait to see it for myself. 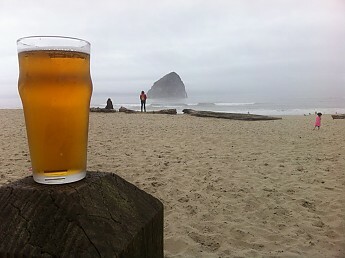 I love that picture of the beer and Haystack Rock! Thanks for sharing these, Kiwi. It looks like you were able to do quite a few outings on your trip. Nice shot of your wife too! Good job getting your nephew out there too, plus the whole family. Bribing with food is acceptable in my book if it keeps kids outside and active. 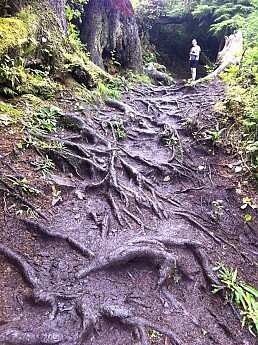 When a day hike can provide pictures like that, you'd better post them, KK! I have a book, 50 Hikes Within 50 Miles of St. Louis. I love to grab it on days when I don't have time for an overnight, but just need some nature for a few hours. All forums: Older: Deepest pit in the United States Newer: "Trailspace Generations"